Have you heard of the phrase, "Gut Feeling"? Or more commonly said, "Gut Instinct"? The chances are that you have heard about the gut's incredible powers to keep things ticking over nicely and you will definitely know when it is not happy. In fact, it could be said that the gut is the motor of the body and when you top it up with good quality, clean fuel (food) it will be very happy and work hard for you but as soon as you start mixing that fuel with toxins and nasty things, that's when the gut will respond and start to cause you problems. SO, HOW DOES THE GUT WORK? To understand the benefits of fermented foods, it is essential that we learn about how the gut works. Firstly, the gut is made up from lots and lots of good bacteria which help to process our food and aid digestion. The microbiota (microorganisms that inhabit the gut) are mainly influenced by our diet and many food ingested bacteria can temporarily join the gut microbiota. This can possibly have an affect on the behaviour of the resistant gut microbial community. Taking supplements such as probiotics or eating fermented foods are examples of how bacteria can be ingested through food consumption. Another thing to realise about the gut is that the gut is home to a core population of good bacteria and is also home to a variable community of good bacteria. All the good bacteria that we ingest through food contributes to the variable community of bacteria. Once the bacteria has been ingested through food, it goes on a journey through the human digestive system which is a dangerous and perilous journey through seas of acid and alkaline making very few bacteria cultures resilient enough to survive. The stomach is rich in acid (PH<3) and contains destructive digestive enzymes such as Pepsin - most bacteria do not survive this first stage of digestion. Those that do survive, pass to the small intestine which has a PH level of over 6 and the bacteria also has to contest with bile and hash enzymes such as Protease, used to break down protein. Some bacteria recover, some grow and once they are ready, they pass to the colon and digestion is complete. Fermentation is an anaerobic (without oxygen) process which converts sugars such as glucose into other compounds such as alcohol, acids and gases to produce energy. Fermentation occurs in bacteria (lactic acid fermentation) and yeast (ethanol fermentation), both of which are used in fermented foods. The unique flavour and texture of fermented foods comes from the bacteria and yeast that was used during the fermentation process. Fermentation in food can occur spontaneously due to the natural Lactic Acid Bacteria surface microbiota or by the use of a starter culture. Fermented foods are essentially ancient foods for the modern gut. The most common, well known fermented foods are Sauerkraut, Kombucha and Kimchi. These foods are rich in Lactic Acid Bacteria and work wonders on the gut! Yogurt - this is the prime example of a fermented dairy product. During fermentation, lactose gets converted into lactic acid, increasing acidity and making it harder for other microorganisms to survive. We also get many beneficial byproducts such as: Vitamin B12, Folic Acid and Biotin. 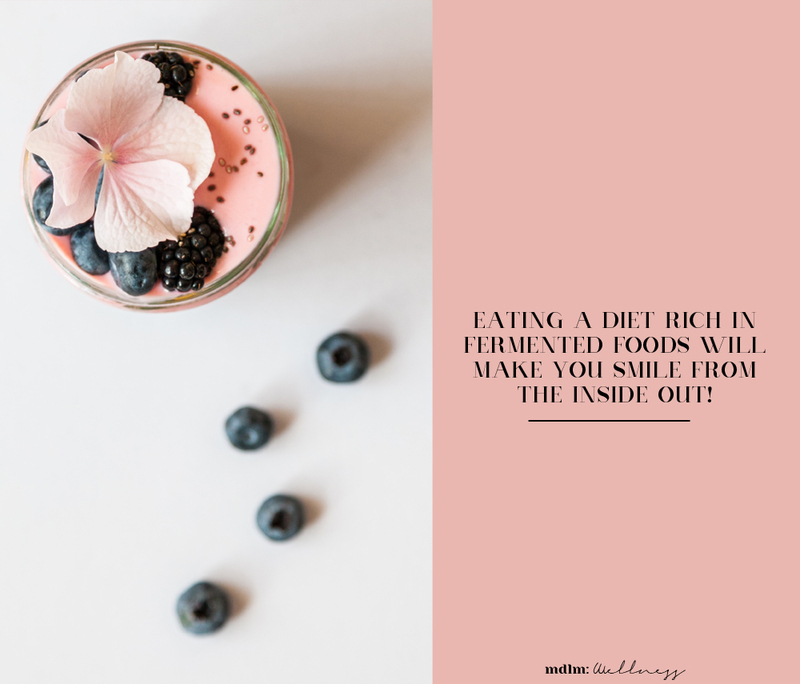 Yogurt contains a rich source of dietary minerals such as Zinc, Calcium, Magnesium, Potassium and Phosphorous and levels of these minerals are 50% higher in yogurt than in milk. Cabbage - Sauerkraut and Kimchi both come from fermented cabbage. Olives - Olives go through a fermentation process when packaged which allows them to be stored for a long time. Typically the fermentation of vegetables occurs spontaneously due to the levels of Lactic Acid Bacteria but starter cultures can also be used to speed up the process. WHY ARE THEY SO GOOD FOR US? People have been eating fermented food for thousands of years to help aid good digestion and to preserve foods in times of scarcity. However the health benefits of fermented food go far beyond their microorganisms. The gut is also a producer of Serotonin, a mood lifting hormone, so a happy gut means a happy life. Fermented foods are rich in Latic Acid Bacteria which helps to reduce the inflammation which contributes to obesity. Gene activity has been scientifically proven to be altered by a probiotic rich diet will help to beat diseases like cancer and other ailments such as urinary tract infections, diabetes and even IBS. 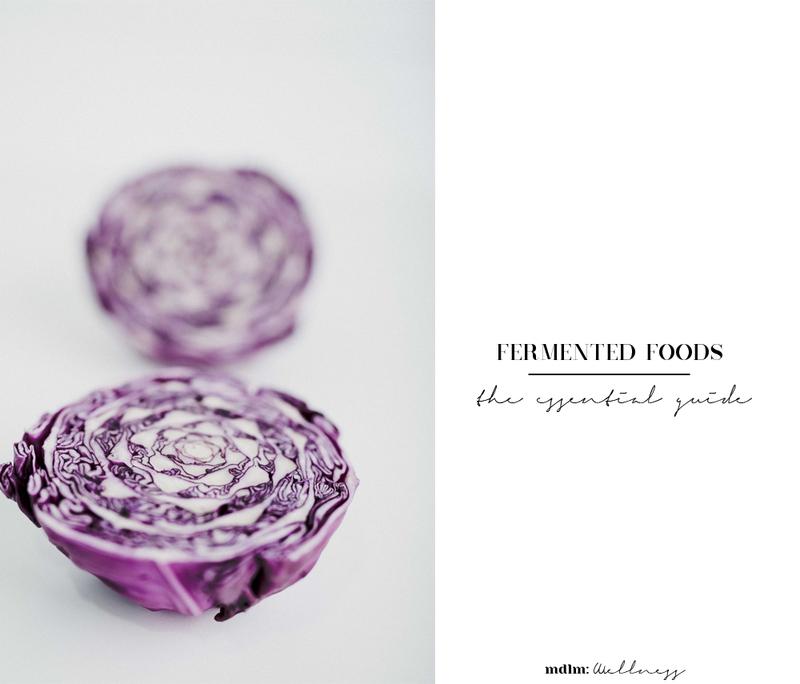 I hope this post has helped to demystify the confusing world of fermented foods and has encouraged you to delve in and ReWild your gut! After all, a happy gut makes for a happy person.